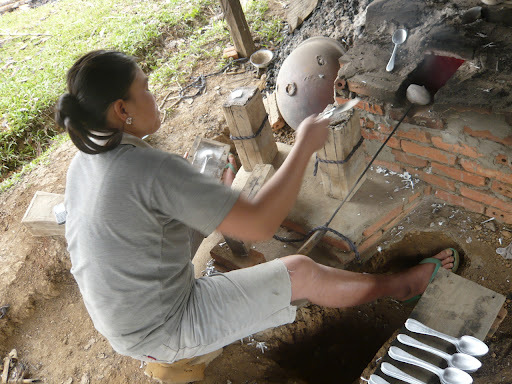 To my regular readers who are wondering what has happened to my posts involving recycling and making stuff out of crap, today’s post is still about my trip to Laos – but just happens to be about recycling too. 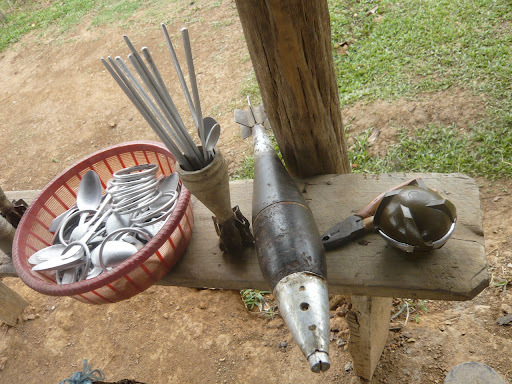 I visited Ban Napia in Xieng Khouang province, which someone else has written about here – basically this place took a battering during the Secret War but the villagers are using aluminium bomb casings and scrap metal to make things like spoons and bangles. 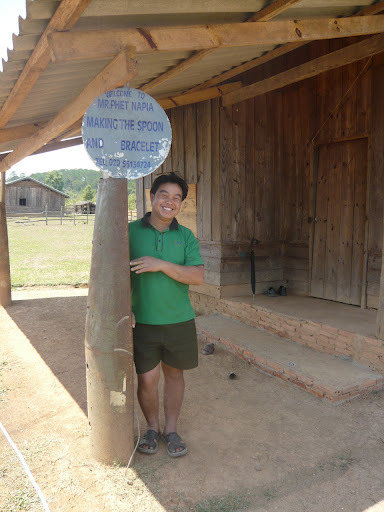 This is one of the villagers who works in aluminium, Mr Phet, at the entrance to his property. The pole he is leaning against is actually a bomb casing! 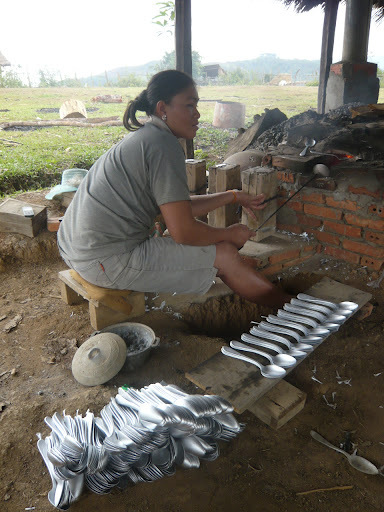 Here’s his wife churning out spoons. She can make something like 1000 a day. Here she is ladling out the molten aluminium to pour into a brick mould of a spoon. Once the spoon has cooled she unties the two sides of the mould and knocks the spoon out. Simple process, but there’s a high rate of rejection! The failures just get thrown back into the pit to be melted down again. They also make chopsticks and bangles which you can see here with some sample bombs (which are of course no longer dangerous!). 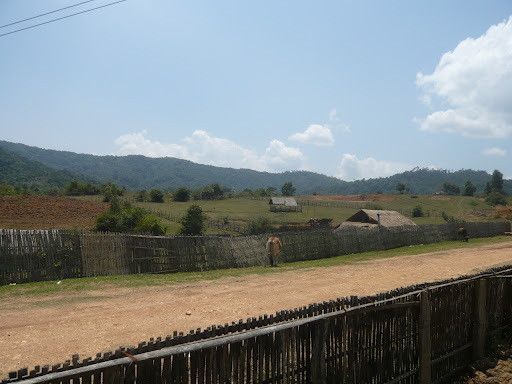 I spent a while with Mr Phet and his wife, with my guide, Ken, interpreting. I’ve designed some jewellery and they will be making the samples from the scrap metal. I also bought some bangles from them and once I start up my online store, you’ll be able to find them there (before I visited Ban Napia I bought about 20 bangles for myself from the night market stall in Vientiane which is a lot easier to find than Mr Phet’s house!). 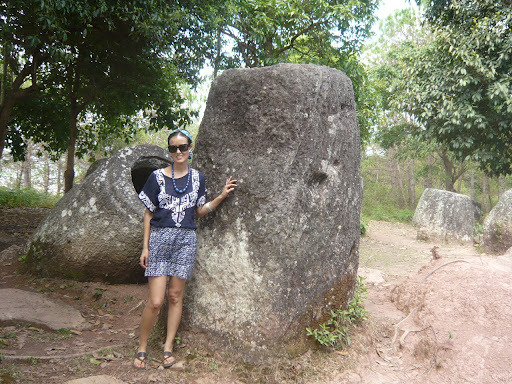 Ken also took me round the Plain of Jars sites – kind of like Laos’ version of Stonehenge. 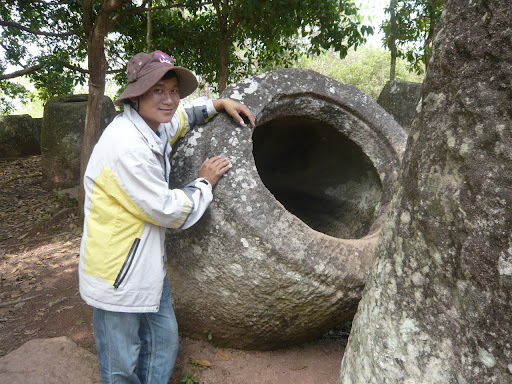 They are huge jars made out of stone that is not found anywhere near where the jars are currently, which is actually many locations in the area. What were they used for? Burial? Making whisky? No one knows. Got to love a mystery! Wow, 1,000 spoons a day? That's incredible! I am loving those ancient stone jars, too, with all their mysteries.